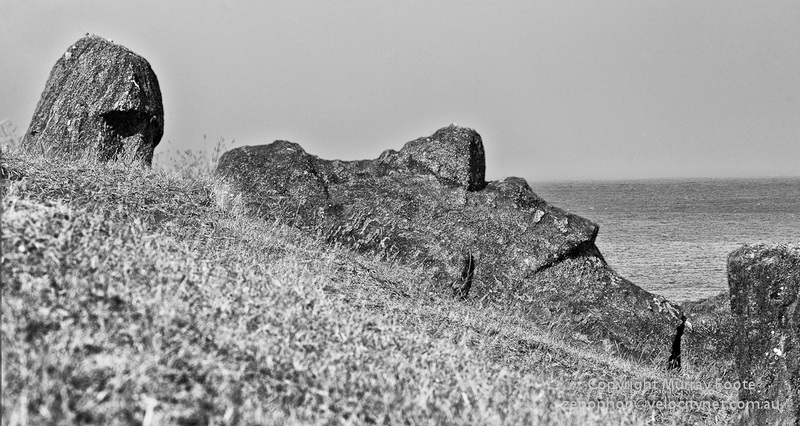 Easter Island: A Parable for Our Times? 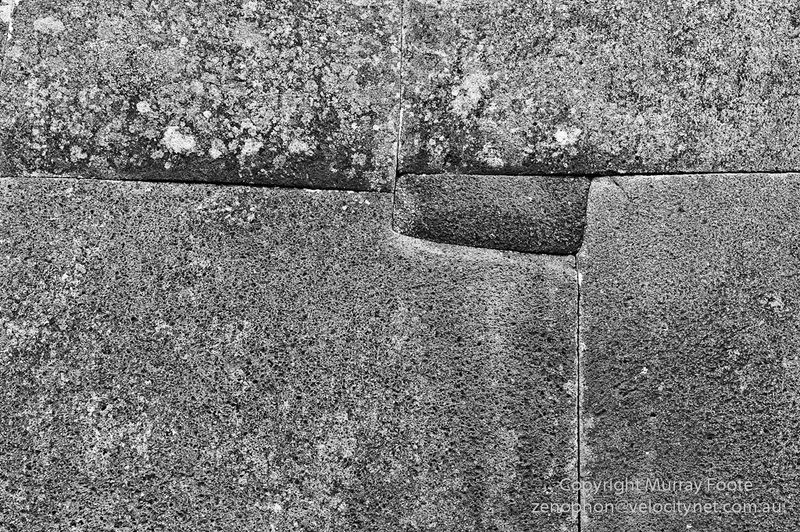 On Easter Island, the evidence of human activity from a bygone age is almost everywhere and asks a multitude of questions with a thunderous silence. It’s almost inescapable to wonder – Does the dramatic decline of Easter Island society speak to us as relevant to the problems of the present? Easter Island is clearly a small island yet increasingly so is the Earth. Improvements in communication bring us all closer together, we can travel virtually anywhere within a few days, world-wide decentralised mass production makes all economies interrelated and increasingly there are many issues that affect the world as a whole. Is there a comparison with Easter Island? They landed on an island thickly forested with huge trees and populated by probably the largest wild bird colony in the Pacific. After some centuries they had constructed a remarkable civilisation, a highly organised society with a successful agricultural system, and undertook remarkable public works that amaze us even today. Unfortunately, this success came at a cost. Within a few centuries they had cleared most of the forest for agriculture. Much of the timber at this stage of abundant resources was probably burnt and wasted. They still used wood for construction, building canoes, moving moai and for firewood, yet the wood they cut down was slow to regenerate. Eventually, all the forest was gone apart from some spindly shrubs up to two or three metres in height. Wild birds and eggs had been a significant part of their diet but they were pretty much either all eaten or their habitat destroyed. Offshore fishing was no longer possible due to the lack of canoes so dolphin and tuna were no longer available as food. Clearing the forest had led to erosion which greatly reduced the agricultural capacity and also adversely affected water retention. As Cook saw, water availability had become a major problem. The population was greatly increasing at the same time as the resources to support that population were diminishing. How had they allowed things to come to this? I can think of four factors – slowness of change, entrenched interest groups, destructive competition and overpopulation following their period of success. Life expectancy was probably about 30 years but the trees took much longer than that to regrow. Drastic change might be obvious if you could see a 500 year period whereas for any 30 year period not much might seem to change. So if life is “normal” and things seem to be going well, there is much less incentive to become concerned about underlying problems. The ariki (chiefs) and the ivi atua (priests) led a privileged lifestyle and demanded huge efforts in public works by the ordinary people. Stopping that system could have stopped their privileged lifestyle. And the whole massive system of conspicuous consumption in building ever bigger ahu (temples) and moai (statues) was driven by competition between clans and sub-clans. No point trying to conserve what someone else would just take. Then when the classical society reached catharsis, prosperity turned to famine and inter-clan competition turned to warfare and even cannibalism. The population fell by 50% or more even prior to the coming of Europeans. When Roggeveen arrived in 1722, the classical society, though diminished, was still intact and functioning but when Gonzales turned up in 1770 and Cook in 1774, the priests were no longer visible and many moai had been toppled. It is therefore likely that the example of the awesomely powerful and wealthy Europeans exploded the power structure and the religion of the classical society and led the Rapanui to overthrow the society themselves. Malthus wrote in 1798 that all societies were doomed to a perpetual cycle of growth and prosperity alternating with overpopulation and famine. In this he was opposing the eighteenth century ideal of perpetual progress. There was no ecological factor to his thinking, so he did not consider that the period of overpopulated desperation might deplete the resource base in ways that would never see recovery. Our society usually claims to have escaped Malthusian cycles by technological progress. Developed countries also seem to escape overpopulation through the demographic transition. Put very quickly, an “underdeveloped” society may have high birth rates and high death rates and exist in a Malthusian equilibrium; a “developed” country may have low birth rates and low death rates and maintain zero population growth; “developing” countries may still have high birth rates but improvements in conditions (health, farming, technology, education) lead to escalating increases in population. So you’d think the solution would be to get all societies to be “developed”. Trouble is, that doesn’t take into account resource usage and “developed” countries use disproportionate amounts of scarce and finite resources. Easter Island is clearly a small island yet increasingly so is the Earth. Improvements in communication bring us all closer together, we can travel virtually anywhere within a few days, world-wide decentralised mass production makes all economies interrelated and increasingly there are many issues that affect the world as a whole. 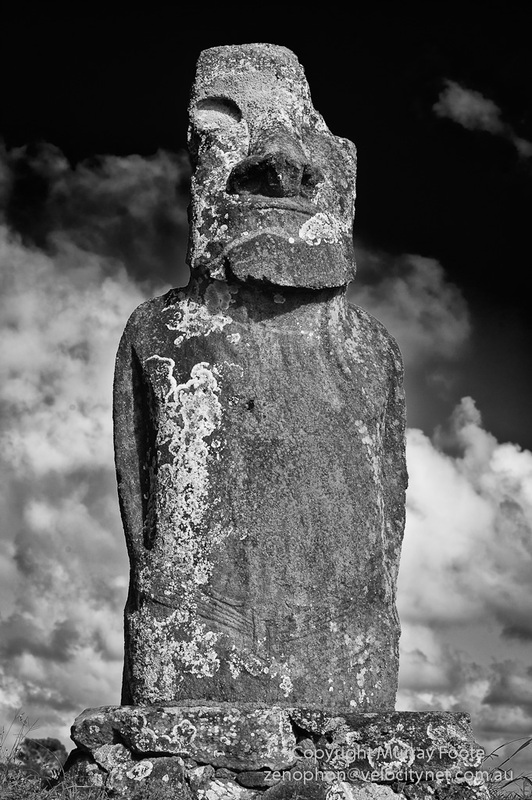 So back to the question – Does Easter Island present a parable relevant to the problems of the present? The World is not likely to fell all forests quite to the extent of Easter Island. For example, some countries such as Germany and Japan have had effective forest conservation policies for centuries. However, worldwide deforestation is a very serious problem. Japan preserves its own timber but imports timber from other countries. Australia, for example, sells wood pulp to Japan for making paper. The prices are very low compared to the price of the paper yet in Australia’s fragile ecosystem, the forests regenerate extremely slowly. In most cases similar exporting countries are poor and in return wealthy countries are exporting their deforestation problems to poor countries. The largest remaining forests are in third world countries, especially the tropical rain forests of the Amazon and Zaire. About half of the tropical forest that existed in 1800 has already disappeared and at the current rate of destruction, there will be little left outside protected areas by 2050. Timber may be increasingly in short supply in some countries. Deforestation can severely degrade cleared land as erosion removes soil, lowers the water table or increases salinity. The most serious issue, though, is the likely effect of deforestation on World climate. 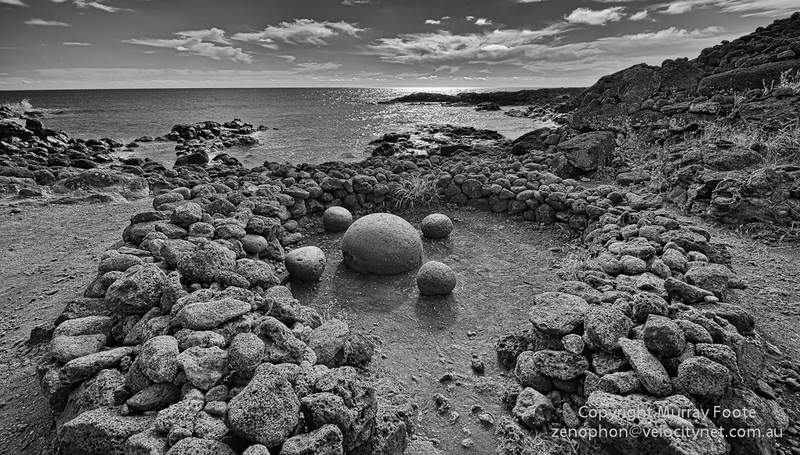 As Captain Cook saw, availability of drinking water was a serious issue for the Rapanui. Most people take the supply of water for granted but it is slowly developing into a serious issue, for some countries at least. Many regions are drawing on underground reserves at an unsustainable rate. This water can be hundreds of thousands of years old and unrestricted drawing up of bore water can also cause problems in soil salinity. There are also many areas where agriculture depends on spring runoff from glacial melt. Most glaciers are in rapid retreat and this kind of runoff may reduce substantially. For example, serious problems for agriculture in Northern India and Bangladesh are likely to develop due to sharply reduced spring water flows resulting from climate change. The Rapanui managed to wipe out most of their wildlife. Essentially this was their birds, reduced from a great host to a few seabirds nesting on small offshore islands. We’re not at a comparable stage of species loss yet, although we’re heading in that direction. We are in the early stages of a global extinction event and it already has a name – the Holocene extinction. While this extinction event covers the whole 10,000 years of the Holocene, it mainly relates to the last couple of hundred years and the primary cause is human activity. 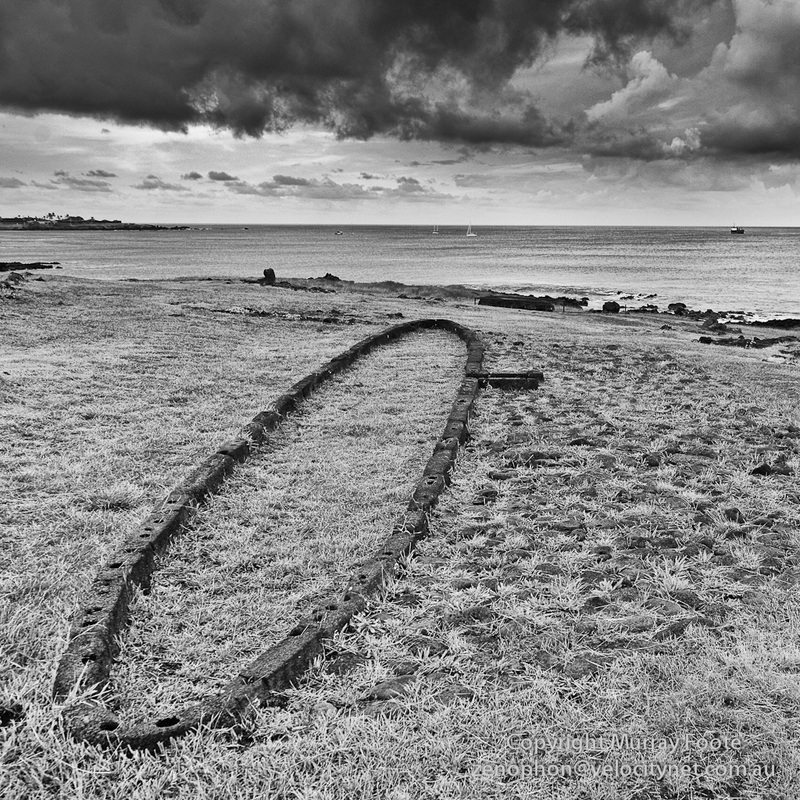 The Rapanui lost access to most of their fish stocks due to lack of wood for canoes which prevented ocean fishing. Our problem is rather different. We have no shortage of big metal canoes which bring back huge amounts of fish but we need to be careful we don’t strip the fishing stocks. It is all too easy to view the oceans as an unlimited resource and awareness of this has improved since the 1970s and 1980s, particularly with the development of maritime reserves and aquaculture (farming of fish and other marine organisms). The main barrier to sustainability is illegal fishing, which can also devastate areas with illegal trawling methods. International trade accounts for 38% of fish and fishery products, making it the most traded food in the world. Over 80% of that trade goes to developed countries, so if other countries continue to become more affluent, it is easy to see there could be greatly increased pressures of demand. Easter Island’s deep sea fishing stocks and marine diversity were significantly reduced by illegal fishing in just the last few years. Without appropriate conservation measures, world fishing stocks could be essentially fished out by 2050 (this according to a UN study). 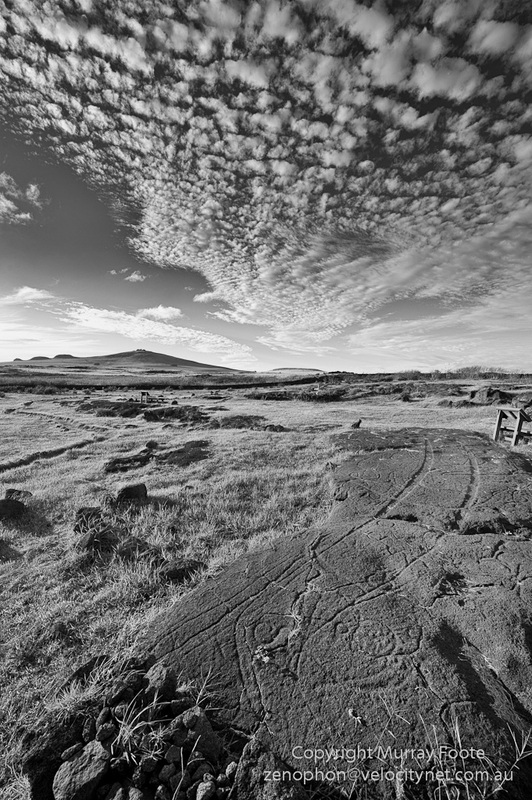 Petroglyphs in a landscape. What may look like vehicle tracks is a canoe carved in the rock. Sometime after 1400, the Rapanui found themselves in an eroded, treeless land that had a reduced capacity to support them and with a population that had grown to an untenable size. There can be no question that overpopulation is a serious issue for the world today. Population growth is most acute for Africa and to a much lesser extent, South America and India. We cannot isolate ourselves from this; increasingly, like the Easter Islanders, we are living in a small and shrinking island (the Earth). Just as with Easter Island, it’s not in anyone’s interest for one group to ride roughshod over the rest. In the words of John Kennedy: If a free society cannot help the many who are poor, it cannot save the few who are rich. One thing that can happen is that when a country sees it is over-exploiting its resources, it takes measures to safeguard them but transfers the exploitation to other countries. This is ultimately self-defeating; when the resources of poorer countries are gone there is nowhere left to turn. While developed countries often have stable population levels net of migration, they use disproportionately large amounts of resources compared to the world as a whole. Many of those resources come from less developed countries. Increasingly there are newly prospering nations that want a share (China, India, South East Asia). We are already familiar with the essentially fixed supply of petroleum that has already peaked. It seems likely that resources will not increase to meet demand this time around. 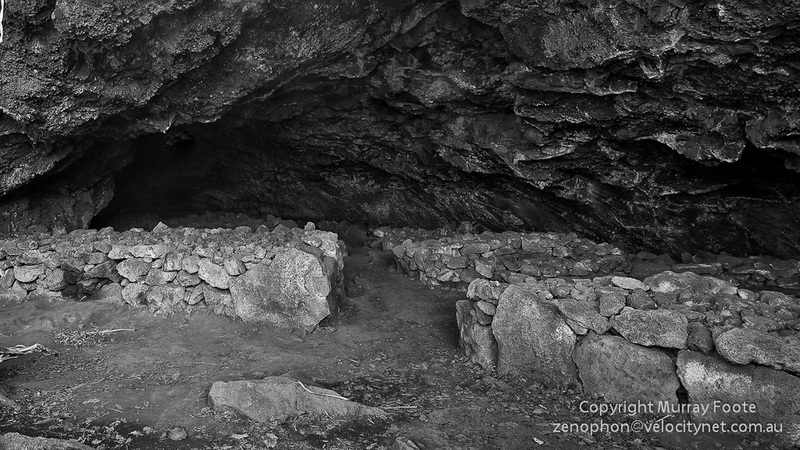 Fortifications inside a lava tube. The piles of rock are about five feet high. 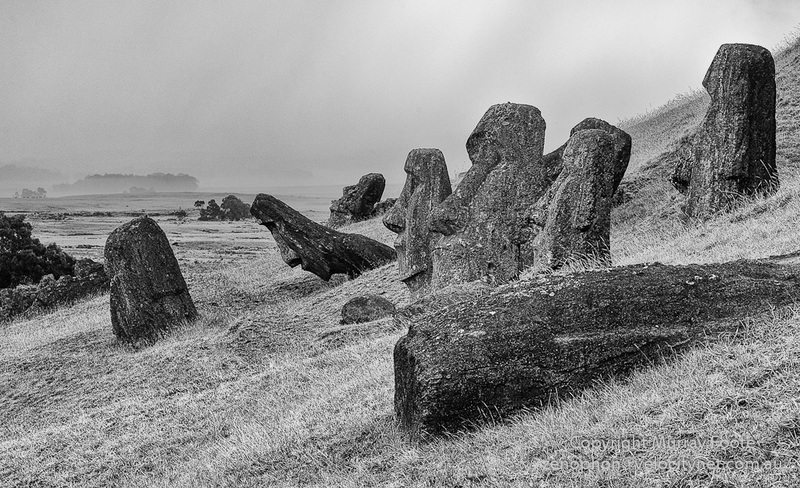 Ecological crisis on Easter Island gave rise to vicious warfare. The same thing happened to the Southern Maya when their civilisation overran its ecological basis. Where nations face the exhaustion of resources upon which they depend, such warfare is obviously possible and war in our world can be truly horrific. We can only hope it doesn’t work out like that. At least some of the time, we may be able to contribute to public opinion and help prevent inappropriate, hasty or even illegal wars. 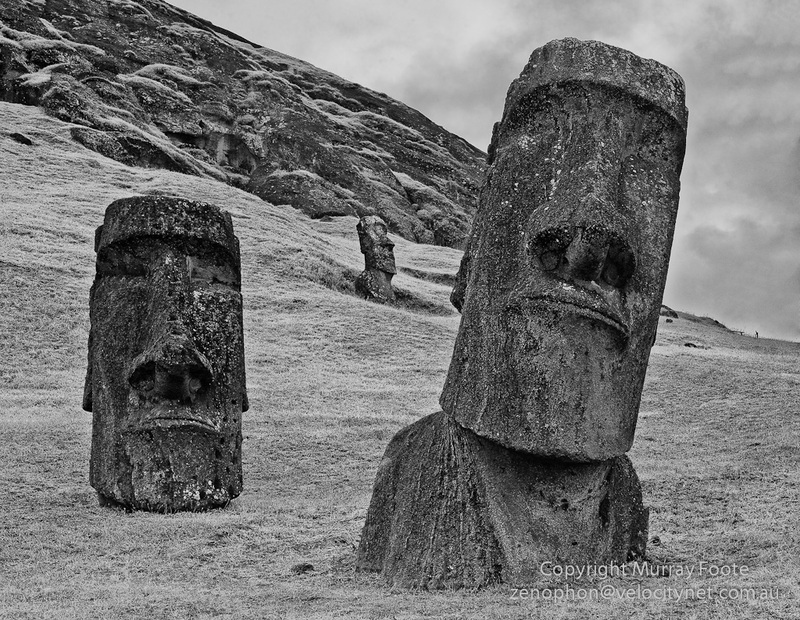 – Is there a Comparison with Easter Island? Deforestation, water availability and species loss are serious problems for us though not often as severe as the outcomes that Easter Island experienced. The Rapanui experienced a reduced supply of fish due to reduced capability to fish, though their fishing stocks, for deep water fish at least, were not greatly affected. We run some danger of exhausting world fishing supplies though effective measures may be in place, as long as we can control illegal fishing. Easter Island experienced severe overpopulation (hand-in-hand with ecological degradation) and their capacity to take effective measures was probably hampered by excessive resource demands of the privileged elite. Many areas of our world suffer overpopulation, especially Africa, while the developed countries (and even elite groups within developed countries) tie up a high proportion of world resources. So if that were it, we could say that there are strong parallels with Easter Island and also significant differences. The world is not as degraded as Easter Island became and we can still address the issues. In the worst case, we would need to settle for a degraded lifestyle, as did the Rapanui before the arrival of the Europeans. However, we also have global warming and climate change to contend with and we need to be very sure we understand and deal effectively with those issues as well. 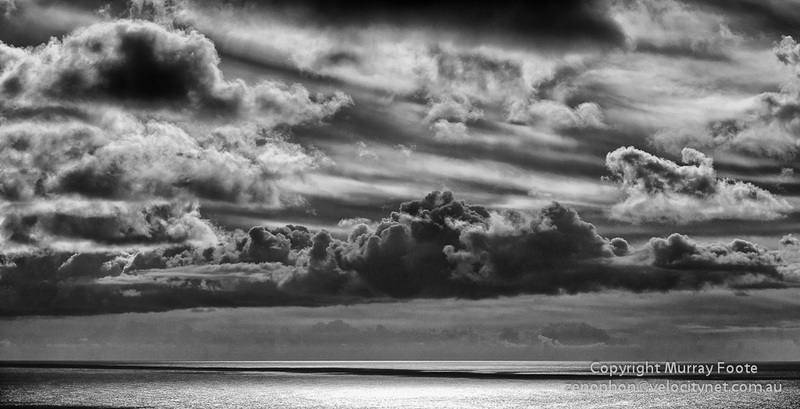 There’s no land out there for thousands of miles…. Sometime between 1400 and 1700, the Rapanui experienced an ecological crisis that resulted in starvation and warfare so that the population fell by 50% to 70%. After that, they may have reached a period of relative stability. They still had a viable agriculture although life was much less comfortable and the numbers they could support had fallen. The issues for the current world that I have summarised above loosely correspond to the crisis that Easter Island went through before European contact. In the worst case, we will turn many regions arid while many species and a significant part of humanity will die. After some time, the chastened humans will regroup and hopefully develop a sustainable way of living under a reduced resource base. Unfortunately, there is more to it than that. In the case of the Rapanui, the cataclysm of European contact – disease, exploitation and slavery –almost wiped them out after 1722. In our case, the somewhat equivalent danger has a quite different cause: global warming and the potential for climate tipping events. Some people deny the possibility of global warming when they say “but it’s cold this year, there’s no warming at all”. This is to misunderstand what it is. Overall there is warming, the glaciers are melting, the oceans are getting warmer and giving rise to more hurricanes, but it also means greater climatic extremes and in the short-to-medium term, some regions will get warmer and drier while other may get cooler and wetter. It is true that there can be large natural variations in climate. It is also true that the great majority of scientists believe that global temperatures have been rising in the last 200 years and that this has a large man-made component. This view is virtually unanimous for climatologists, those scientists who specialise in climate and climate change. The most unsettling risk is the possibility of the world ecosystem degrading to fundamentally change the conditions for life. It has happened before, in previous global extinction events. It could happen fairly quickly and only be reversible in the very long term, and then to a completely different world, a climate tipping event. As it stands, if we keep on as we are without effective remedial action, the consequences will be severe. However, we are not yet at the point of no return. We can still turn things around. I think that no-one really knows how much time we have so it is better to act sooner rather than later. The complication is that there are significant lags involved. The effective action we take today may take several years to bite. If necessary, we must be prepared to take one step back to take two steps forward. If we wait until the situation is catastrophic, it might be too late to recover from. In economic terms, we are used to assuming we can always have progress but it’s not necessarily so. In Europe, for example, Greece’s debt is 150% of its GDP, Ireland’s government deficit is 33% of its GDP, Spain’s unemployment is 20% and Italy owes France $500 billion. A number of developed countries including the US and Japan appear to have long-term economic problems that will not be easy and quick to address. We have seen the Japanese experiencing serious problems with explosions in their nuclear reactors, still supposedly under control but unresolved. Germany and two other European countries have abandoned nuclear power after studying what has happened in Japan. Indonesia is a much poorer country also prone to earthquakes, volcanic eruptions and tsunamis. If a situation like Japan’s were to happen in Indonesia, I don’t know what it might develop to if it were to keep on getting out of control. It couldn’t be good, especially if there were other severe problems to deal with at the same time. Other countries could at some time descend into economic chaos, civil war or anarchy in such a way as to imperil their reactors. The economics of wind and solar power keep improving while nuclear power is a short-term solution (plants last for 20 to 50 years) with long-term dangers (waste stays radioactive for hundreds of thousands of years). Tim Flannery has an interesting view here, though. He says that notwithstanding the dangers of nuclear power, the dangers of coal power (for global warming) are larger and more immediate. He also says that wind and solar energy may be cheaper than nuclear by 2018. We have no way of knowing whether the Rapanui saw their oncoming ecological problems and tried to do something about it while they still had time. My guess is that they didn’t. There might have been a groundswell of opinion from the common people for sustainable change but it was probably too unequal a society for that to be possible. The ariki mau (the divine paramount chief) could have summoned the ivi atua (priests) & the ariki of the clans and compelled them to accept new social & ecological practices to achieve a sustainable society. Something like this happened in Tokogawa Japan and in quite a different way in the Polynesian island of Tikopia. My guess is he didn’t, and any attempts were certainly unsuccessful. The ahu and moai got larger at the end so the Rapanui classical culture probably went out in a spectacular display, trying to persuade the Gods to restore their prosperity. The ariki and the ivi atua were also entrenched interest groups who probably felt threatened by any prospect of change. Today, progress towards a constructive outcome is impeded by politicians who serve their own interests rather than the common good and by special interest groups who represent ecologically questionable practices. In both cases, they are arguably not acting even in their own best interests. We’re not doomed yet although we are clearly facing risks. I think all of us have a responsibility to Life itself to understand these issues. Progress will require concerted and enlightened action by government bodies at national and world levels. It also requires that “we, the people” support appropriate and positive action wherever we can. Developing a consensus for change is much more productive than competitive argument. Any risks of moving to a more sustainable society and then finding out it wasn’t as bad as we thought are nothing compared to the risks of doing nothing until it’s too late. Let’s imagine a world in sustainable balance in fifty or two hundred years – how could we get there? Developed countries will not be able to wall themselves off from the rest of the world, even if they can attain sustainable development internally. Therefore, as well as considering the problems of our own countries, we must consider how we can solve ecological problems all around the world. Action on global warming is under way and if successful it will avert a climate tipping event. In that case, the developed countries will probably achieve some measure of sustainable development sooner or later. The later that is, the more reduced the resource base will be to operate from (and perhaps, the more like Easter Island). We need effective policies to ensure that world climate remains amenable to human life. This has started but there is much to be done. There can be long time lags for measures to bite. Awareness is probably relatively high in Europe, Canada and New Zealand but in the US and Australia there are currently a disturbingly high number of people who think there is no problem and are not prepare to sacrifice a cent for a problem they can’t see. In the longer term, this is more important than disaster relief because it will help to prevent disasters. There of course needs to be safeguards against corruption and against siphoning off to first world salaries. The objective of this would be to protect resources, improve living standards and to stabilise populations (eg low family programs, contraception, public awareness campaigns). This may be hard to achieve politically, especially if countries become more and more immersed in their own problems, but if we do not help to solve the ecological problems of poor countries, they will also become ours. 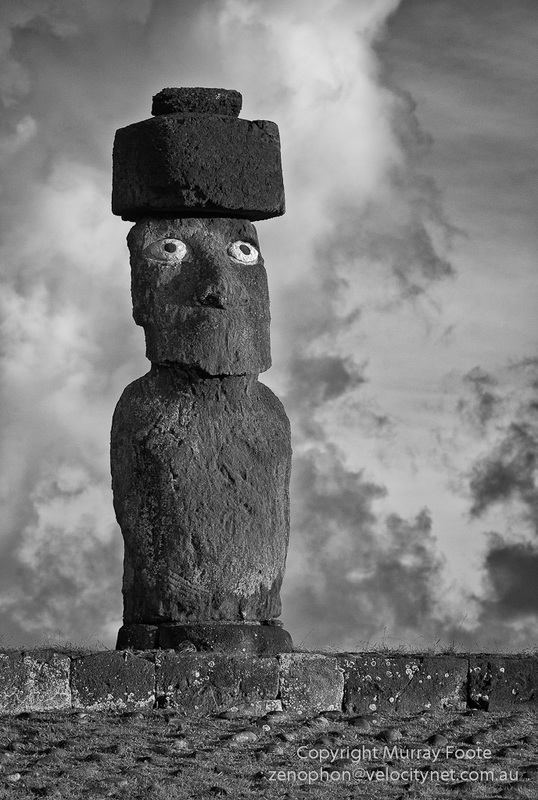 One clear warning Easter Island shows us is that the point of greatest apparent prosperity can also be the point at which the resources that generate that prosperity are exhausted. Prescience rather than mindless greed is at a premium. Reality will inevitably be untidy and incomplete. We have a responsibility to understand as much as we can and support sustainable policies where we can. We can at least try to be part of the solution rather than part of the problem. Comments are welcome. Differing opinions are fine. Please ensure that comments are polite and reasonable. 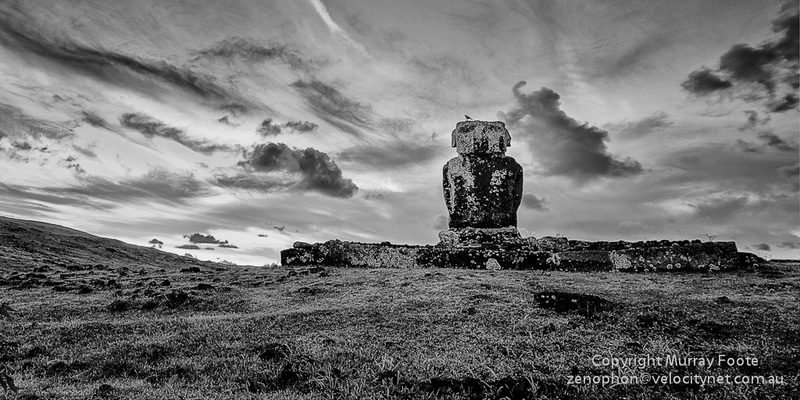 (Note: I have separated out this post from 27th April: Easter Island (Ahu Runga Va’e and Ahu Hanga Te Tenga). Earlier comments on that post relate to the analysis above).